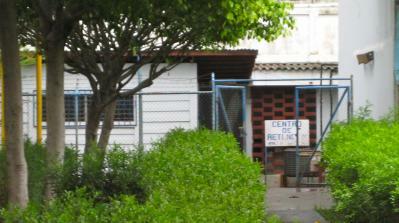 the nicaraguan government releases very little official information on this center, but we know from the advocacy work and human rights monitoring of servicio jesuita para migrantes that the center consists of three rooms where anywhere from 5 to 100 detained migrants might be held at any one time. the migrants are usually detained in transit through nicaragua on their way to the U.S. or Canada. they are originarios of south america (esp. colombia, peru, ecuador), central america, the caribbean, africa (esp. eritrea and somalia) and asia (esp. vietnam and nepal). some have been detained for as long as 3 months, waiting either approval of their refugee or asylee petitions or deportation to home countries. deportation is of course complicated when migrants flee political violence, which is the case in many of these sending countries. with SJM, visiting fulbrighter anne and i attempted to enter the centro de retención (housed at the migration offices in downtown managua), but were denied access. apparently the government is becoming increasingly reluctant to open the center for fear of human rights denunciations. i am currently very involved in SJM’s work for a migration reform policy here in nicaragua (see future posts), and improved conditions and legal access for detainees in nicaragua will hopefully be one of the platforms for advocacy.